My kids asked me the other day about how the tradition of Halloween started, and I did what I normally do when they have really great questions… I turned to Siri, and we were given a great history of how Halloween began! We also learned that when the tradition of trick or treating began people would pass out fruit, nuts and coins! Can I just say that I love this idea and truly wish we could go back to that tradition instead of loading children with sugar each year! With that said, there are some fun healthy Halloween foods that can be made, and instead of handing out candy you could go for some healthier options. My kids love decorating for Halloween, and as soon as I pull the bins out with all of the decor they are digging through it! They love placing everything all around the house. Which includes these beverage clings that they stuck to our glasses! Aren’t they cute!? You can find some online, we found ours at Target last year. You could even make your own if you have a vinyl cutting machine. 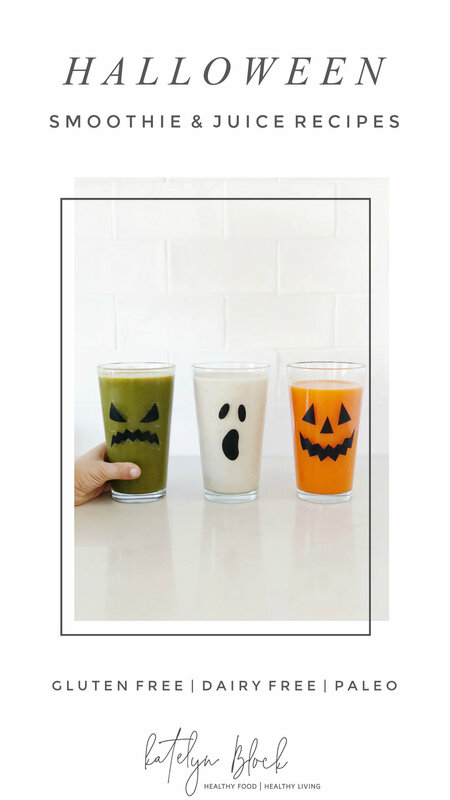 I made two different juices to fill the pumpkin and monster glasses, one green, and one orange. Then I made a banana coconut smoothie for the ghost glass. You can find the recipes below! Green Monster Juice - Find my favorite green juice recipe, HERE. Blend all of the ingredients together in a blender until smooth. Add ice if needed. Place all ingredients through a juicer and serve cold or over ice.